We're back from Spring Break and all the excitement of the Art Show. This week is already starting off with a frenzy of activity so I'm up early and thought I would share a little more about this past week with you. 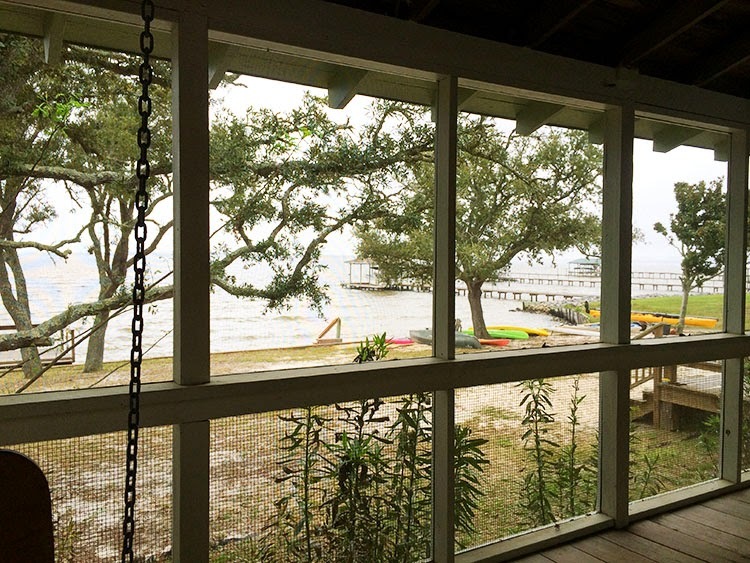 The HUGE wrap around screen porch was our favorite 'room' in the whole place. 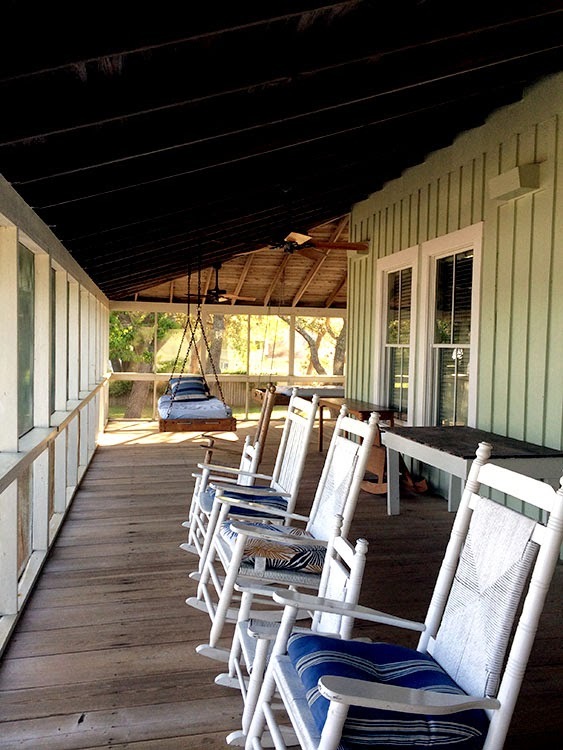 There were oodles of rocking chairs, three hanging beds, a hammock, and a porch swing. Heaven! I even got a little work done from one of the hanging beds. I just pulled up a table and set to work making these stacking rings. This was my view while I worked! As for the art show this weekend. . .Y'all!! I was so, so anxious. I was a bundle of nerves and excitement and tense energy. I was able to go and set up a few hours before the show, which helped get out some of that energy. This was my table all set up for the show. Pat laser cut me a few busts that I altered with some paper but the rest of my displays were made with items from the dollar store that I spray painted and glued together. The large baking sheet on the back right didn't work out so well as the necklaces kept sliding off. Here's a closer look at the left side of my display. You should be able to click the photo for a larger image. And, this is the right side. It's a bit harder to see since the door was on that side. I'll admit that I was clueless about what I needed to do. I tried smiling and saying hello to each person that looked over my pieces. I told them to let me know if they had any questions. But, I have such a hard time speaking to others that this took every ounce of my willpower. I ended up selling a few items, making a trade with one of the other artists, and garnering some attention as quite a few people took my cards. I even talked with the owner of a local boutique who gave me some tips and said she might be in contact with me. I went home happy but extremely exhausted. This event was only a few hours long and it was a perfect starting point for me for something like this. I'm relieved to finally have some experience doing it and that makes me happy. Pat and I have some tweaks to make with the displays, but it went well all in all. I gained so much from it. I'd love to know if you have any tips on doing an art show: presenting yourself and your product in the best light. Now. . .to face this frenzy of a week!! Here's hoping you have a great one. I used to do shows and talking to people was always the hardest part for me too. If things aren't real hectic, it might be helpful to have a small area behind your table where you can be "working" on a piece of jewelry. Something simple that won't take a lot of supplies. This way people will see you working on something and you aren't "Staring" at them hoping to make a sale. Then you can just do exactly what you did - look up and smile and tell them to ask if they need some help. You are off to a great start! Your table looks great but I think you need even more inventory out - you want people to see lots of choices. The first few times I was terrified and sure I would screw up, panic,knock over things and even fall over. I still get un-nerved when a show opens but quickly feel OK. Being a manager in my past of 70 people I learned quickly that each one had to be read and I would have to adjust to them. Some folks walk by and size you up (hate that) some are shy and I would compliment their cloths, jewelry, hair to open a conversation, some do not like to be watched (makes them feel like a criminal) and lots others know how to casually shop. My greatest difficulty is taking compliments so I just try to be humble. The best advice is in the future is to observe and take mental notes of peoples behaviors and soon you will be able to see what kind of customer is approaching. Make it a game, it helps occupy time. Chris, I really appreciate the tip about taking it from a management/behavioral angle. That's right in my wheelhouse. I too was a supervisor of people as well as have a background in psychology. . .I can possibly put all that training and experience into play with these kind of situations (if something like this ever comes up again). Fortunately, I took Pat with me to give me moral support and that helped so much as he encouraged me and pushed me to keep going. Thanks bunches for the advice! I feel happy for you - this is a great experience and a logical step forward! So happy your show went well! Okay, I could use a week on that porch with that view. I'm so glad you did an art show! I know how hard that was for you, but you did it!! It gets easier each time you do it, but it also can be exhausting manning a booth all day. I like Kim's idea of you working in the background while people look at your items. Lorraine, Yes! Even though I squeezed in some work for the show, I'm glad we were able to have some time to relax. The porch was the best part. We spent every morning on the porch swing with our coffee before the kids woke up (we took the nieces with us). Fortunately, the show was only a couple hours long (a great first time experience) as I came home sore and exhausted from the amount of mental energy I felt like I exerted. I would have loved to have busied my hands and mind with some work while I was there, but the really wasn't enough space for that in this particular situation. Perhaps if I do another show, my work does relax me for sure! Thanks!! Jenna, Thank you for that confidence boost and reminders. I appreciate it all so much! This all happened so fast but it's been a long time in coming too. Thanks so much for your support. Congratulations on your first show! I'd be way to nervous to sign up for one. Hopefully it was just the first of many successful shows to come. So glad you got your first show behind you! Sound like it went well, you sold some things, got some practice, got some exposure and learned some things, can't ask for more. Awesome! Debbie, It really was pretty awesome. It was an emotional roller coaster, but I'm glad I took the chance. Now I have a better idea about what works and doesn't as well as what catches people's eye. Thanks so much for your kind words and popping in!! I think your space is very inviting - love your colorful earring cards and jewelry tags and I would definitely walk up to your table. And I agree with one of the other comments - it would be great to offer more choices. Sounds like your show was just as it should have been for a first art show. You came away feeling like it was a good experience, overall. Talking to people as they look at your work is hard for everyone at first, I think. You handled everything just as you should have...speak and smile, then let them talk more if they want. Some folks just want to look. Your display was awesome...you and hubby make a good team on that front! You will get so much faster at the setting up part as you do more shows...Can't wait to see where it takes you! Your stack rings are similar to some I've made. I'm sort of afraid to put mine in the shop though...they're so tiny and easy to "get lost" or walk away, if you know what I mean. Our taste in jewelry creation is so much alike. I love everything you make! Judy, Thank you for the reassurances. I felt like a wreck, but totally tried to hide it. I was stressing about how I priced everything, the display, what I'd worn, everything! Yeah, Pat and I make an exceptional team. Of course, he's the rockstar. I try not to let him get into the jewelry-making too much as he would do so much better than me, it would make me so jealous! I completely forgot that you make the stack rings too. Yours have fun touches of rhinestones and whatnot in them too don't they? Mine are just some vintage buttons and were a great, quick project to work on while we were on vacation. I totally know what you mean about them being so small. Me putting them on the clothespins made them a little more fiddly and conspicuous, but I don't think that would help much in your shop. I can't wait to get the time to go over there. I was hoping to go this afternoon or tomorrow, but the rain has me stuck at home right now. Soon though, soon!! :) Missed you today! I hope you're having a nice week with the hubby. Your first show sounded like it was the perfect length of time to not be completely overwhelming and to learn a lot and sell some too. Your display is really nicely laid out. 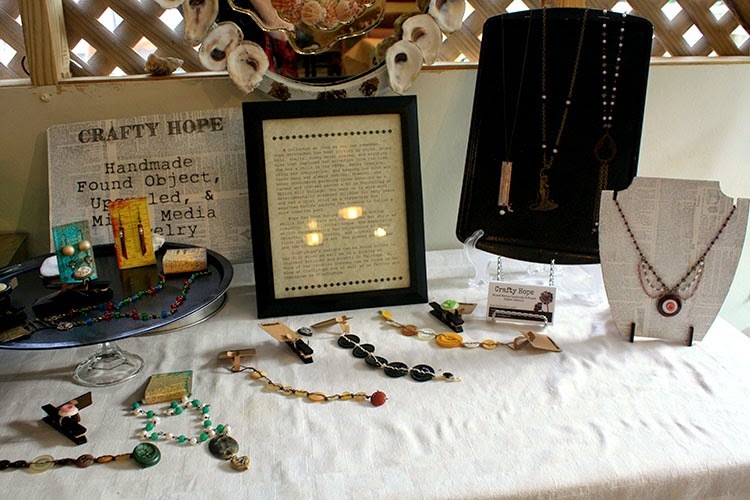 I did a bunch of shows a few years back and the displays were ever-changing, trying to find the right fit for my beads. Rice trays (copper trays I filled with rice) seemed to be a big hit. I could display a whole lot of bracelets in those and it was easy for people to pick them up and try them on. The rice was very tactile and people liked that too. 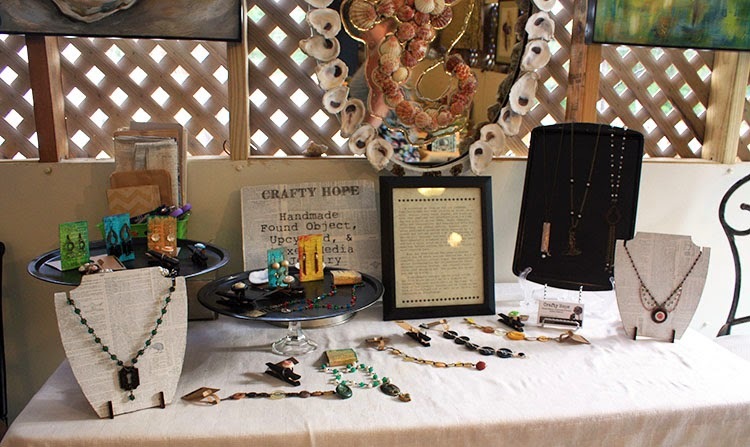 The stack rings you made on vacation ~ do you use the clothespins are part of the display? Because that looks fantastic! And speaking of vacation ~ with that porch, and that view, who needs the rest of the house?!? Gorgeous!!! Shows are physically demanding as it is, but putting yourself out there, basically opening your heart and soul to people by showing them your creations? That's REALLY draining. It does get easier, because you gain more confidence in yourself each time you're out there. And your work is so lovely and fun, people will respond well to it. Hooray on the contact with the boutique owner!! Kudos to you Hope for putting yourself out there. I don't have much advice as I have only done a couple of shows and I only sold 2 pair of earrings at each one. 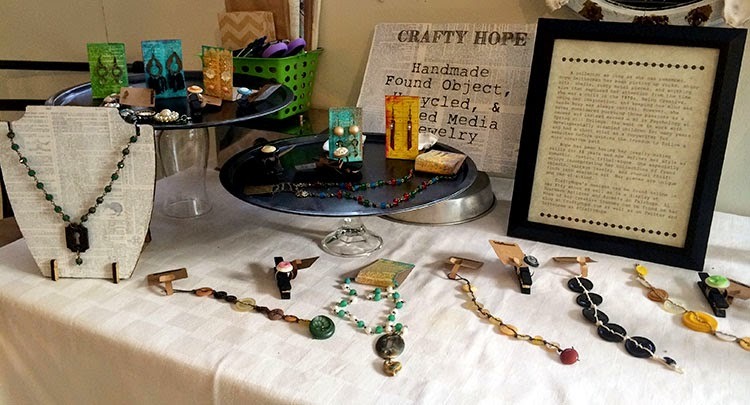 They were craft shows not art shows and I feel that may have been why sales were not good. I have been scared to try again. I like your display. 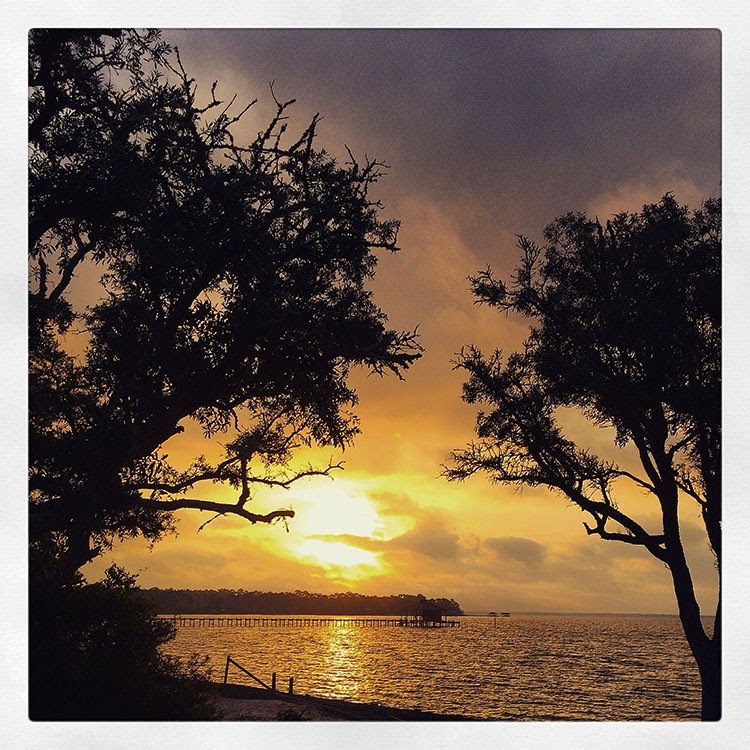 Your vacation sounds fabulous, especially with such a serene view and place to create! Congrats on having your first show! Your table looked very inviting, I know I would have stopped by. Each show will get easier. I am ultra shy around people I do not know, so when I do a show I talk about my process and the materials involved. Most of my beads have a story behind them so that helps kick start a conversation.